Abell 61 (PLN 77+14.7) is a rarely imaged, faint planetary nebula in the consetallation of Cygnus located at RA 16hr 19m 31s and DEC +46d 15m 49s. North is to the left in the image, east is down and the field is ~22 arcmin. Abell 61 is about 3.4′ in diameter and mostly round. Abell (1966) described it as “incomplete rings with gaps”. The central (mag 17) variable star is WD1917+461. 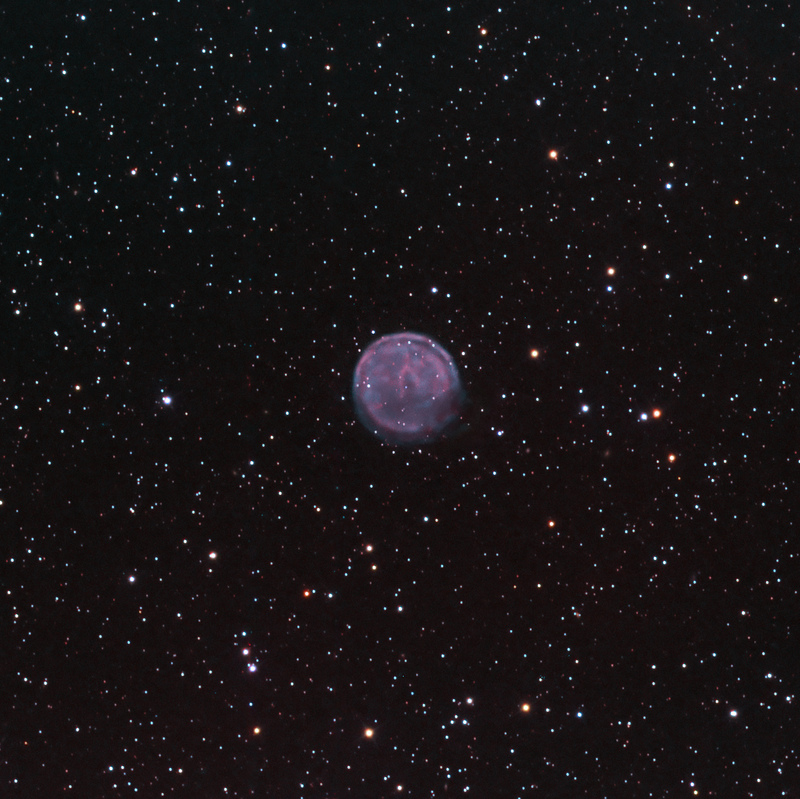 Abell 61 is interacting with the interstellar medium according to Tweedy and Kwitter (As.J. v108/4, 1994, p188), which may help to explain the brightened, distinct rim toward the WNW (upper left) compared to a fainter, and what appears to be a disrupted rim toward the ESE (lower right). The expansion velocity is 30 km/s. Photometric analyses of central star are typical of an unreddened hot star with Teff > 60,000K. Its distance is unknown. There was an expectation that OIII would dominate this object, but the H-a signal was quite strong. In addition, the 3 nm narrowband filters show internal structure within the nebula to the point where it appears that there are two rings, both of which are disrupted in the ESE (lower right), perhaps corresponding to the gap mentioned by Abell. It may be possible that we are looking at two superimposed lobes of bipolar planetary nebula. There is not much written about Abell 61 in the scientific literature. There is additional structure within the central portion. RGB data were added based upon a G2V white point for star color. A number of small, faint galaxies can be seen in the background.